The impact this Spooky Swiss Meringue Skull will have when you set him out on the table will be one of freight, and delight. 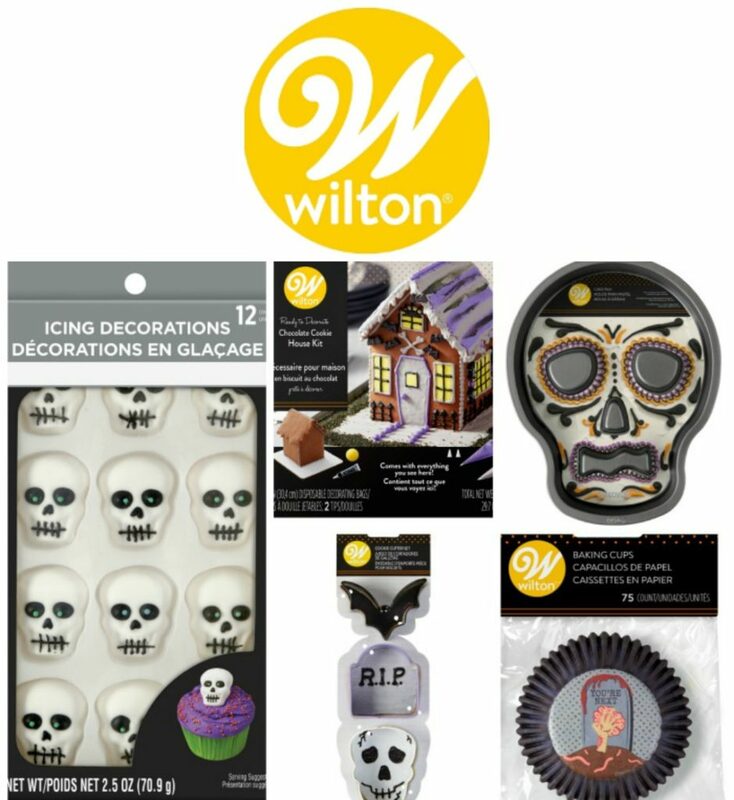 Welcome to day three of #HalloweenTreatsWeek 2018, and don’t forget to scroll down, all the way to the bottom for your chance to win some great prizes supplied by our sponsors for this event! 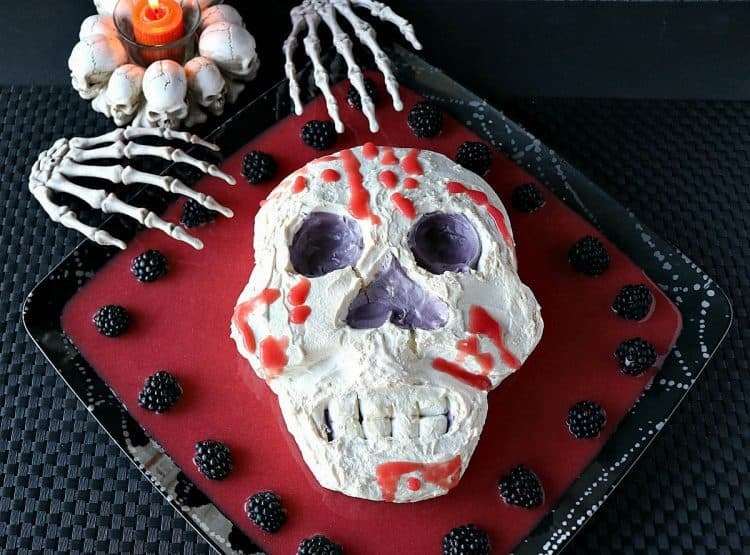 With its marshmallowy texture and strawberry puree ooze, this Spooky Swiss Meringue Skull will want to make you close your eyes when you’re spooning this dessert into your mouth. **Disclaimer – This post and recipe were created for #HalloweenTreatsWeek! 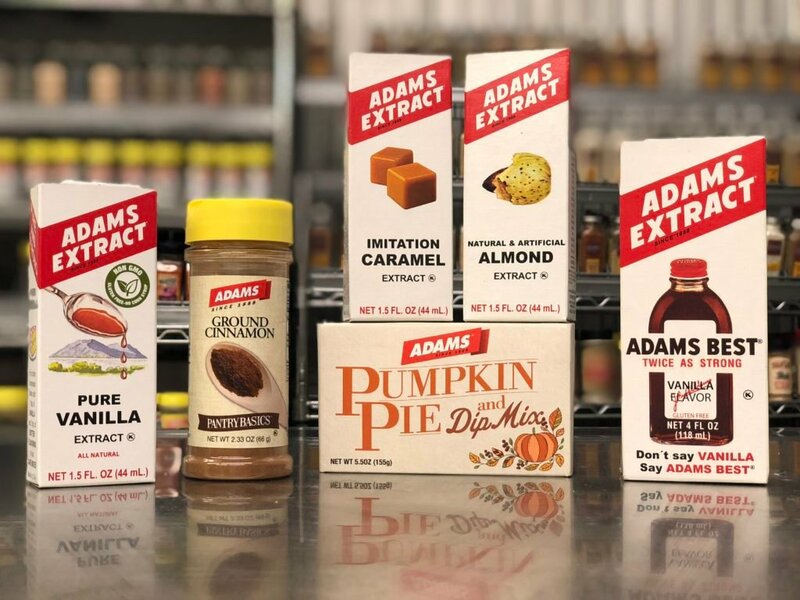 I was sent samples by some of the sponsor companies but as always the opinions I share are 100% my own. 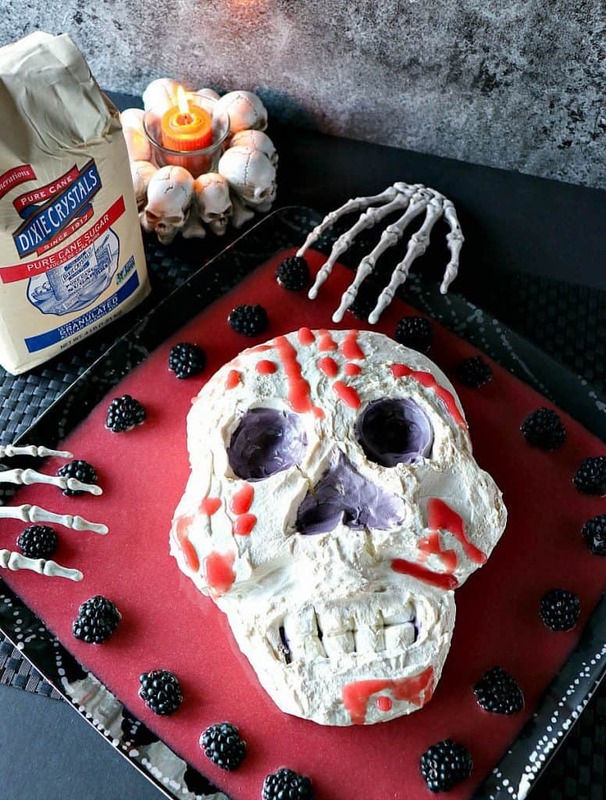 **Please Note – The printable recipe card with detailed instructions and complete ingredient measurements for making this Spooky Swiss Meringue Skull is available near the end of this post. A bit of patience and courage to fiddle with the design until you’re happy with the looks. This was my first time ever making a Swiss meringue, and I wasn’t quite sure what to expect. The reason I chose to use a cooked Swiss meringue is that I’d read it’s a more stable meringue and one that would hold its shape better than an Italian meringue or French Meringue. To say I was a little nervous about how this Spooky Swiss Meringue Skull would turn out is an understatement! But once I get an idea into my thick skull (see what I did there? HaHa! ), it’s pretty hard for me to shake it! I did fiddle with this design longer than I had anticipated, but I’m hopeful that you’ll benefit from my experience and the will learn from the photos below. Assemble the ingredients and separate the egg whites from the yolks. Reserve the yolks for another purpose. Add the egg white and sugar to a large, heatproof bowl (I used the bowl from my stand mixer). Whisk the whites and sugar together. Place the bowl over a medium saucepan that has approximately ½” of water in the pan, making sure the water does not touch the bottom of the bowl. Bring the water to a low boil, whisking the egg whites and sugar continually until the sugar is fully dissolved and the mixture is foamy. *Note – pinch a little of the egg white mixture between your fingers and if it still feels grainy, continue heating until the mixture is completely smooth. Using the whip of a stand mixer, or a hand mixer, whip the meringue base (starting on low and gradually increasing the speed to high) continually until the mixture begins to thicken noticeably (approximately 3 minutes). Add the vanilla, cream of tartar, and salt to the bowl and continue whisking on highest speed until soft peaks form. 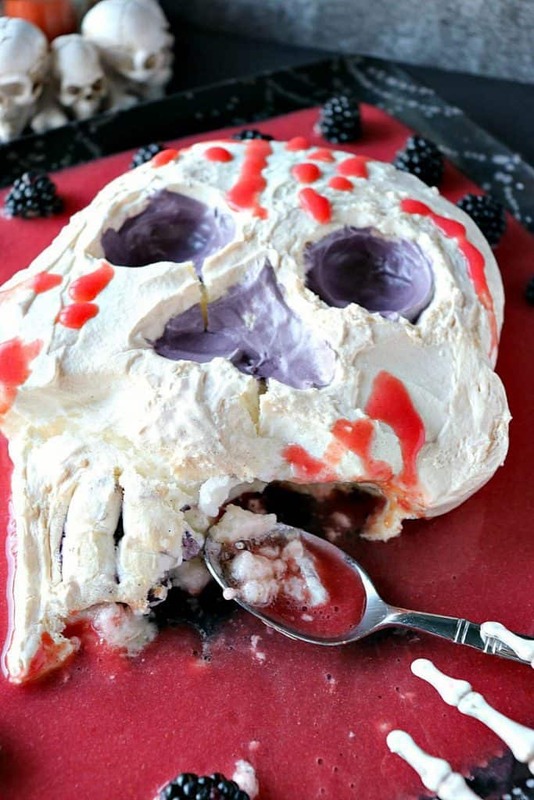 Using a photo of a skull as a guide, spoon most the Swiss meringue into a general skull shape onto a baking sheet which has been lined with a Silpat sheet. Reserve approximately ½ cup of the meringue for coloring. Set aside. Use an offset spatula or butter knife to gently shape the skull. You’ll want rounded head, square jawline, and pronounced cheeks. Use the offset spatula or butter knife to carve an upside heart for the nose, two large’ish holes for the eyes. Use the offset spatula to carve away some of the meringue to form chiseled cheekbones and an open mouth that will fit his teeth. As needed, build up his cheekbones and chin with some of the remaining meringue which has been carved away from other parts of his skull. Color the set aside meringue with a drop or two of black food gel. Stir to combine well. Using the offset spatula (or I found that fingers work well for this), gently smooth the colored meringue into the crevices carved for eyes, nose, and mouth. Cut 4 mini marshmallows in half and press them into this mouth and gum area. Gently brush (i.e. wipe) some of the meringue over the “teeth” if desired. Preheat the oven to 200-degrees and bake the Swiss meringue skull for 5 hours. Turn off the oven, keep the door closed and allow the skull to cool completely inside the oven. When the skull is completely cool, remove him from the oven and gently and carefully slide a large spatula under the skull and lift him to a serving platter. *Note – His underside will be sticky, so spraying the large spatula with baking spray or coconut oil is very helpful. Blend frozen strawberries until completely smooth. Pour the strawberry puree around the Swiss meringue Skull and drizzle some of the strawberry puree directly onto the skull itself. 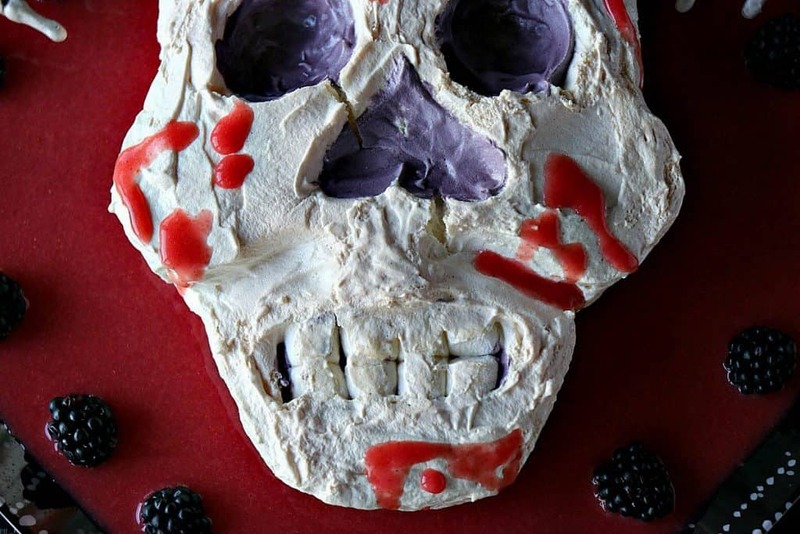 Below is the printable recipe card for today’s Spooky Swiss Meringue Skull. If you’ve enjoyed this recipe and look forward to making it (or have already made it), I’d appreciate if you’d take a moment to give it some feedback by way of stars near the comment section at the end of this post. Thank you so much! Place the bowl over a medium saucepan that has approximately ½" of water in the pan, making sure the water does not touch the bottom of the bowl. Bring the water to a low boil, whisking the egg whites and sugar continually until the sugar is fully dissolved and the mixture is foamy. *Note - pinch a little of the egg white mixture between your fingers and if it still feels grainy, continue heating until the mixture is completely smooth. Use an offset spatula or butter knife to gently shape the skull. You'll want rounded head, square jawline, and pronounced cheeks. Use the offset spatula or butter knife to carve an upside heart for the nose, two large'ish holes for the eyes, but not carving completely to the bottom of the meringue. Color the reserved meringue with a drop or two of black food gel. Stir well to combine. Cut 4 mini marshmallows in half widthwise and press them into his mouth and gum area. Gently brush (i.e. wipe) some of the meringue over the marshmallow teeth if desired. When the skull is completely cool, remove him from the oven and gently and carefully slide a large spatula under the skull and lift him to a serving platter. *Note - He will be sticky, so spraying the large spatula with baking spray or coconut oil is very helpful. Blend frozen strawberries with a little bit of water until completely smooth. Pour the strawberry puree around the Swiss meringue Skull and drizzle some of the strawberry puree directly onto the skull itself for a creepy effect. Chill until ready to serve. Serve at room temperature or slightly chilled. 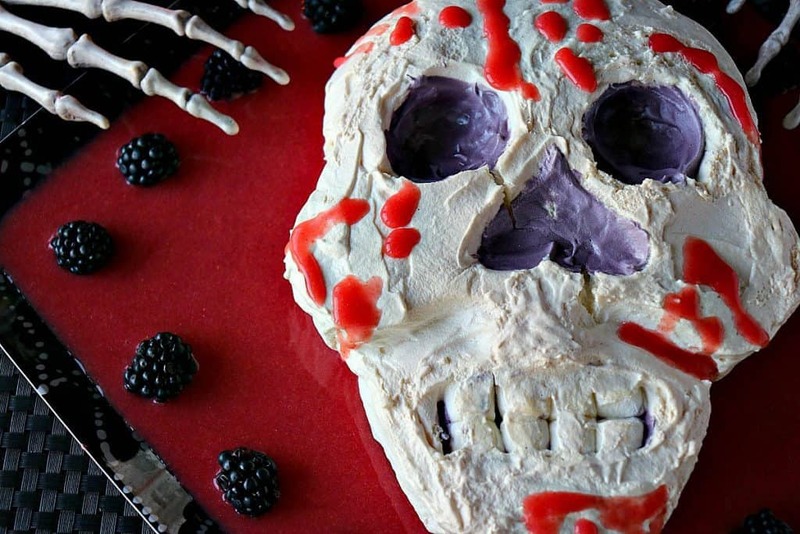 I sincerely hope you’ve enjoyed today’s recipe for this Spooky Swiss Meringue Skull for #HalloweenTreatsWeek as much as I’ve enjoyed bringing it to you! 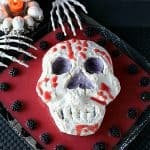 MORE fun and spooky Halloween recipes by this year’s group of #HalloweenTreatsWeek food bloggers, PLUS the exciting giveaway promotion that you can enter for your chance to win some pretty awesome prizes supplied by our sponsored brands; Dixie Crystals, Adam’s Extract, Wilton, Sweets and Treats Shop, and Treat Streat USA! Thank you all for your sponsorship and for the products you’ve supplied for this event!! I’m also excited to be linking up this post to Pint Sized Baker. Thank you! 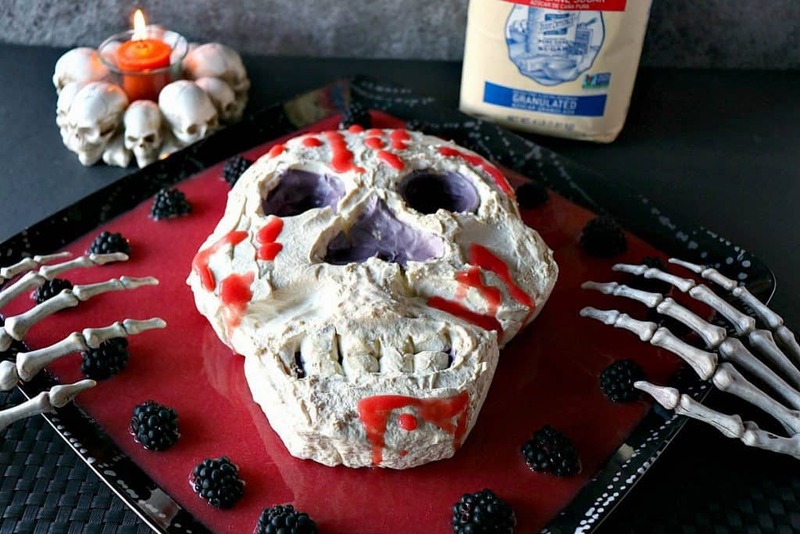 Should you have any questions regarding today’s recipe of Spooky Swiss Meringue Skull for #HalloweenTreatsWeek, or anything else you’ve seen on my site, please don’t hesitate to contact me directly or leave me a comment in the comment section below. It is always my distinct pleasure to get back to you with a reply just as soon as I possibly can! This is so seriously fun and festive! I absolutely love how it turned out. I want to try! You 100% need to make one! I’ll bet it turns out fantastically! 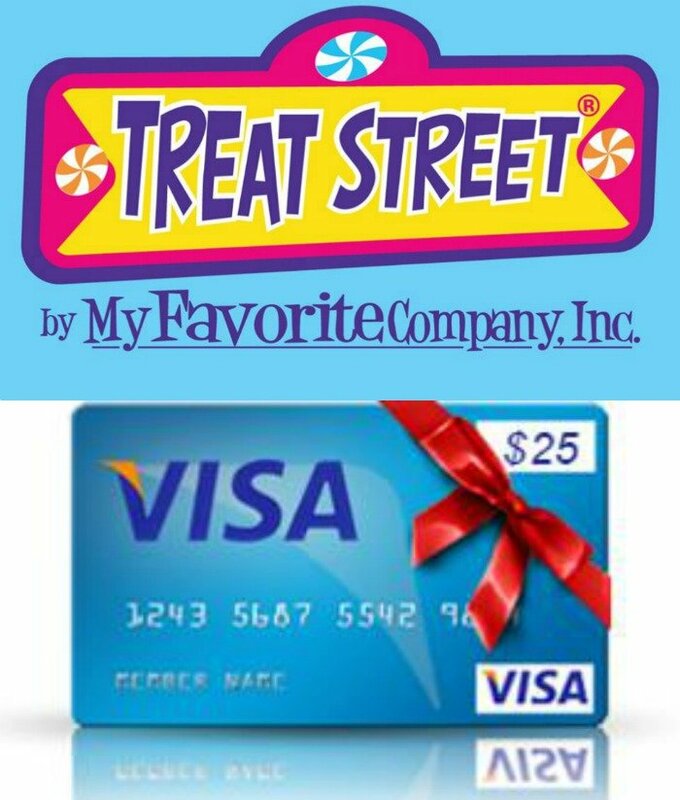 This is such a fun treat for Halloween! The kids will love it! OMG! There are so many fun ideas in the Halloween posts. You have outdone yourself with this one. Low calorie and super scary and appropriate for a Halloween party. Bravo! Thank you so much, Beth Lee. I’m thrilled you approve! Happy Halloween! You really created such a fun dessert! Those marshmallow teeth are super cute. I always fail at Swiss meringue. I am definitely trying your step by step instructions. This was my first time with Swiss meringue. I fiddled with the skull quite a bit, but the meringue was forgiving and easy to make. Try it. 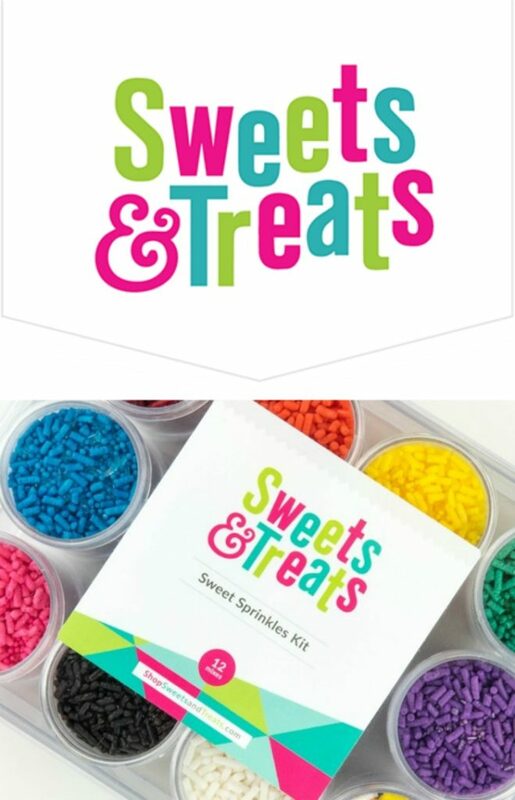 This is such a fun treat! I love anything with meringue!! Me too. It’s delicious! Thanks.